The Clod-Buster is a tough-as-nails, portable topsoil screener that saves you time and money. 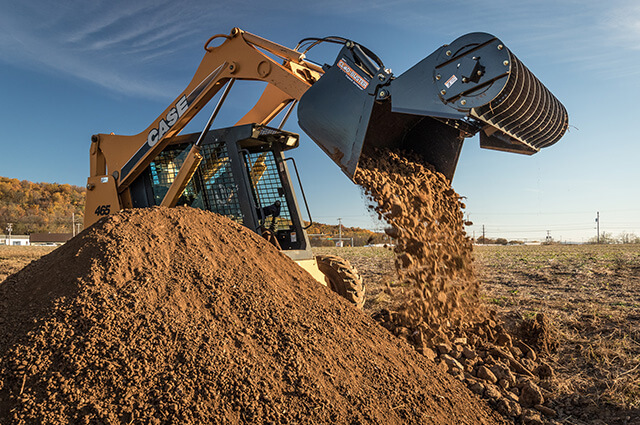 Attaching to the front of a skid steer, this bucket screener provides you with unlimited access to high-quality premium topsoil. 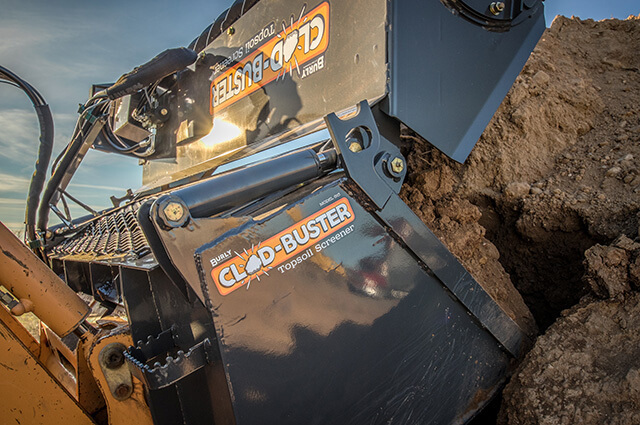 Whether you work as a landscaper, excavator, or project manager, the Clod-Buster will work hard to make your job a whole lot easier. Begin with the mound of unfiltered topsoil to be screened with the Clod-Buster. With the hood in the “raised” position, the scoop grabs a bucket of the unscreened soil. The hardox steel filter drops over the bucket. The motor activates, causing the agitator to spin. The topsoil pours through the filter — while the rocks are filtered out. 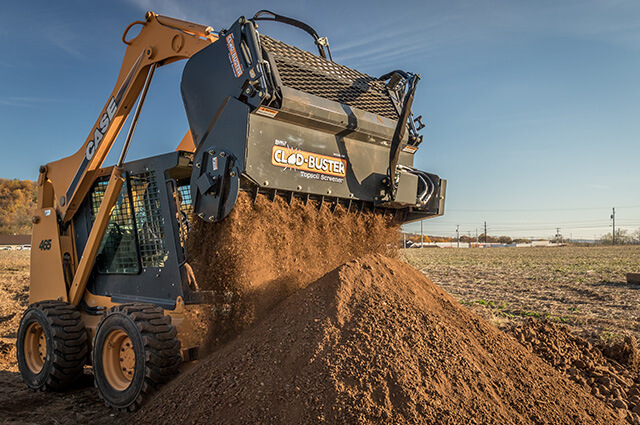 The high-powered beater pulverizes the dirt — busting dirt clods – and creating premium filtered top soil. Dump the rocks from the bucket and you’re ready to screen again. The prized load of filtered topsoil remains. Just how effective is the Clod-Buster? Our portable screener is more effective at eliminating dirt clods than a massive stationary screener. This entire process takes under a minute for experienced skid loader operators. A few buckets of dirt — and a few minutes of work — replaces hours upon hours of waiting for a delivery of filtered topsoil. If you’d like to learn more about the ins-and-outs of the Clod-Buster, read our FAQ’s! Want to make this topsoil screener a permanent fixture in your toolkit? We’re offering demos for local customers and shipping the Clod-Buster all-across the county. Contact us to learn more, check our price, and order now!